TWO URBAN LICKS’ INCREDIBLE WOOD-FIRED CUISINE, LIVE ROTATING ROTISSERIES, UNIQUE 26 FOOT WINE ON TAP BARREL WALL (THE FIRST IN THE COUNTRY! ), FUNKY LIVE BLUES, BREATHTAKING DOWNTOWN SKYLINE VIEWS AND THE “WOW” DESIGN CENTERED AROUND THE FLOOR TO CEILING TODD MURPHY PAINTING LIT BY A GAS LAMP WALL MAKES TWO TRULY ONE OF A KIND. THE INNOVATIVE, DOMESTIC AND INTERNATIONAL, WINE PROGRAM CONSISTS SOLELY OF STAINLESS STEEL BARRELS OF WINE DISPLAYED IN A 26 FOOT, GLASS AND STEEL, TEMPERATURE CONTROLLED TOWER SITUATED PROMINENTLY IN THE RESTAURANT. WINES ARE DRAWN BY GRAVITY AND SERVED AS A HALF GLASS, GLASS, MINI THIEF (10 OUNCES), HALF THIEF (20 OUNCES), AND FULL THIEF (42 OUNCES). THE TOWER, WHICH CAN HOLD 6 BARRELS ACROSS, FEATURES A GRAVITY FLOWED SYSTEM FOR POURING AND A SCISSOR LIFT THAT RISES TO THE TOP ALLOWING FOR MAINTENANCE AND REPLACING OF THE BARRELS. THE BAR ALSO BOASTS 4 IN HOUSE DRAFT COCKTAILS, INFUSIONS AND A STATE OF THE ART BEER PROGRAM. TWO HAS GARNERED AN ABUNDANCE OF LOCAL AND NATIONAL ACCOLADES INCLUDING CONDE NAST TRAVELER’S “HOT LIST”, BON APPETIT’S “HOT 50 TABLES” AND ONE OF RACHAEL RAY’S “FAVORITE RESTAURANTS” IN THE COUNTRY AS TOLD TO INSTYLE MAGAZINE. NOMINATED LOCALLY YEAR AFTER YEAR AS “BEST RESTAURANT SCENE” AND “BEST PLACE TO TAKE AN OUT OF TOWNER”, IT IS NO WONDER THAT GUESTS KEEP COMING BACK FOR DINNER SEVEN NIGHTS PER WEEK AND BRUNCH ON SATURDAY AND SUNDAY. TWO ALSO FEATURES LIVE BLUES WEDNESDAY THROUGH SATURDAY. TWO IS LOCATED DIRECTLY ON THE BELTLINE AND OFFERS AL FRESCO DINING WHICH SECURED TWO’S TITLE OF ONE OF “AMERICA’S BEST OUTDOOR RESTAURANTS” COURTESY OF TRAVEL + LEISURE. Florida native Michael Bertozzi has been working in restaurants since he was 15 years old. 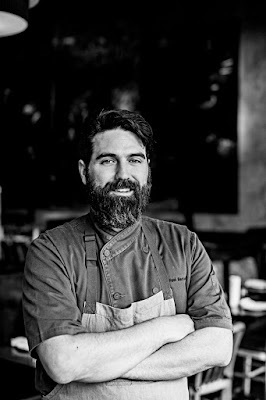 Born and raised in Jacksonville, Bertozzi credits his passion for Southern cuisine to his mother and grandmother, both native Texans. His father, a native of Peru, provided international influence in regards to exploring exotic flavors. However, it took a bit of soul searching to take this influence and find his true calling in the kitchen. As TWO urban licks' executive chef, he will continue to showcase wood-roasted meats and fishes with the touch of heat that Atlantans have come to know and love.